Sleepovers, also commonly referred to as slumber parties, are all about spending quality time with close family or friends. 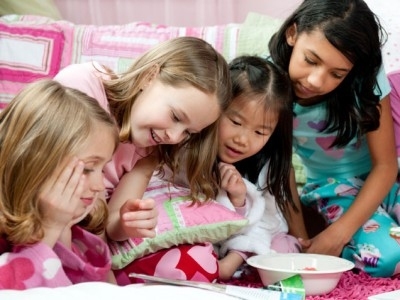 A lot of activities can take place during sleepovers including building forts, pillow fights, watching movies while chewing on popcorn and sipping on hot chocolate. For girls, a sleepover is not complete without makeovers, spa night, games and garb. In this article, you will find useful content on fun sleepover games for tweens (aged 10-12) to make the sleepover a worthwhile experience for you and your guests. You can also play those games if you are at a little younger or older age. This is a variation for the famous ‘pass the parcel’ game. The only difference is that you get to play it in the dark. Ask your guests to sit in a circle and put on some good music to play in the background. A pillow is to be passed round until the music stops. The person who ends up with the pillow when a song ends should be punished. The punishment should be something fun to do and a bit crazy. This is also a great game to play in the dark. In this game, you switch off the lights and one of the guests has to guess who’s who in the room. You can ask the guesser to leave the room for a while as you decide on which role each one should take. To keep the game interesting, choose creative characters to make the guessing process a bit hard. For example, roles of animals (each one makes a different animal sound) and roles of people you all know (each participant acts like that person). The work of the guesser is to determine who is saying what and gets a point for each correct guess. This is one of the most interesting and fun sleepover games to play at a slumber party. A participant has to be blindfolded and apply makeup on another girl. This can go around until everyone has makeup done by a blindfolded participant. Ensure you take pictures when done as these can serve as great memories. In this game, you need a large space where you place all sleeping bags in a circle. There should be one less sleeping bag than the number of people taking part in the game. Start some music and have the participants walk round the circle of sleeping bags. Once the music stops, each of the participants has to get into the sleeping bag. The one who fails to find one gets out of the game. During the slumber party, you can hold any kind of talent hunt pageant. Girls always enjoy talent hunt games. You can have each of the guests sing a song and a judge will announce who sings best. You can also have a dancing competition, modeling and even acting roles. Also, give every participant the chance to exhibit their talent. If the guests enjoy making crafts, this one can be a great activity for a sleepover. These crafts can comprise of items that can be used as friendship items like bracelets or jewelry. You can also arrange for drawing and painting gigs. These can later be framed, and each guest can take their crafts home. For this game, you will need one of your participants to take up the role of the ‘snuggle bug’. You can choose the person to play the role through a raffle. The ‘snuggle bug’ has to go to any part of the house to hide. The other participants have to go round looking for the ‘snuggle bug’. The lookers need to go around asking ‘are you the snuggle bug’, when the answer is yes, they have to join the ‘snuggle bug’ in hiding. The game ends when the last person finds the ‘snuggle bug’. There can be a prize for the last person to find the ‘snuggle bug’. One of the fun sleepover games incorporates fun and competition. It is especially great for Christmas season sleepovers. For this to happen, you will need a jar of Vaseline, a large bowl, cotton balls and a timer. Each participant has to place a large amount of Vaseline on their nose’s tip. The idea of the game is to ‘pig out’ as many cotton balls from the heap as possible using the sticky nose. Once collected, the cotton balls have to be shaken off to the floor. The player who collects most balls and place’s them on the floor wins. This is a nail polish variation of spin the bottle. In this game, you need to collect different nail polish colors. Each girl should have the chance to spin a bottle of nail polish. The girl the cap points once it stops spinning will have to apply the particular color on one of their fingers. By the end of this fun sleepover game, almost all players will have different colors of nail polish on their fingers and toes. For this game to be possible, a large inflatable beach ball has to be availed. Write questions all over the ball. The ball should be passed around and whoever ends up catching it has to answer the question pointed at by their thumb. Once done, they should throw the ball to another participant. Have a wide range of questions that would be interesting. This is also an interesting a fun filled game that mostly centers on teamwork. Sit all your friends in a circle and get an orange. The idea of the game is to pass the orange round without using your hands. Players are allowed to get creative as long as the hands are not used and the orange is successfully passed around without dropping. The one who drops the orange while passing it on loses. This game involves everyone in the sleepover. You need a timer. Set a timer and ask all but one participant to leave the room. The remaining participant has to hide the timer. Once the others come back, they have to find the timer before it goes off. The one who finds it gets to hide it next, and also gets a prize. If the timer goes off before it is found, the person who hid it gets a prize. This is a new-generation hide and seeks game that involves the use of a cell phone. A player has to take the mobile phone and hide anywhere in the house. Other players have to turn off the lights and try to find the one hiding. Every once in a while, the person hiding has to call the house phone to give clues of where they are hiding. One person can use night vision and a video camera to record the game and watch the video later.